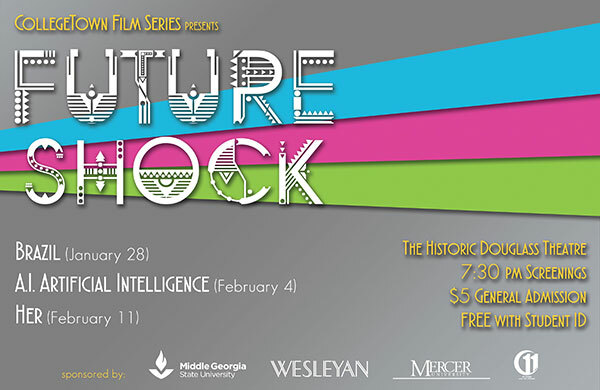 “Future Shock” is the theme of the 2016 College Town Film Series at downtown Macon’s Douglass Theater, hosted by Middle Georgia State University, Mercer University and Wesleyan College. Art and literature often help us to imagine life in times to come. Films are especially adept at immersing us in the sights and sounds of prospective worlds. This year’s College Town Film series presents three movies that shock us into looking ahead to the future. At 7:30 p.m. Thursday, Jan. 28, 2016, Tom Ellington of Wesleyan College will present and lead discussion of Terry Gilliam’s dystopian extravaganza Brazil (1985). Set in a retro, low-tech world, mired in authoritarian bureaucracy, Brazil follows the travails of Sam Lowry, a low-level technocrat whose life gets turned upside down by a clerical error. Gilliam’s highly imaginative and visually ambitious film earned Oscar nominations for Best Original Screenplay and Best Art Direction. It stars Jonathan Pryce, Kim Greist, and Robert De Niro. At 7:30 p.m. Thursday, Feb. 4, 2016, Patrick Brennan of Middle Georgia State University will present and lead discussion of Steven Spielberg’s A. I. Artificial Intelligence (2001). Director Stanley Kubrick delivered his treatment of the story of David, a robot child who dreams of becoming a real boy, to Spielberg shortly before his death. Spielberg spins it into a sprawling tale of an uncertain tomorrow, where toys and machines begin to develop feelings, even as humans appear to relinquish theirs. It stars Haley Joel Osment, Jude Law, and Frances O’Connor. At 7:30 p.m. Thursday, Feb. 11, 2016, Craig Coleman of Mercer University will present and lead discussion of Spike Jonez’s Oscar winning, offbeat romance Her (2013). In a near-future Los Angeles, Theodore is a shy man who falls in love with Samantha, an artificially intelligent operating system designed to meet his every emotional need. The Los Angeles Times describes Jonez’s film as “a risky high dive off the big board with a plot that sounds like a gimmick but ends up haunting, odd and a bit wonderful.” It stars Joaquin Phoenix, Amy Adams, and Scarlett Johansson. Admission to all films is free to students with college IDs. All others pay $5 admission, which includes a small popcorn and drink. For more information, please contact Bob Burnham of Middle Georgia State University at 478-471-2999 or at bob.burnham@mga.edu.